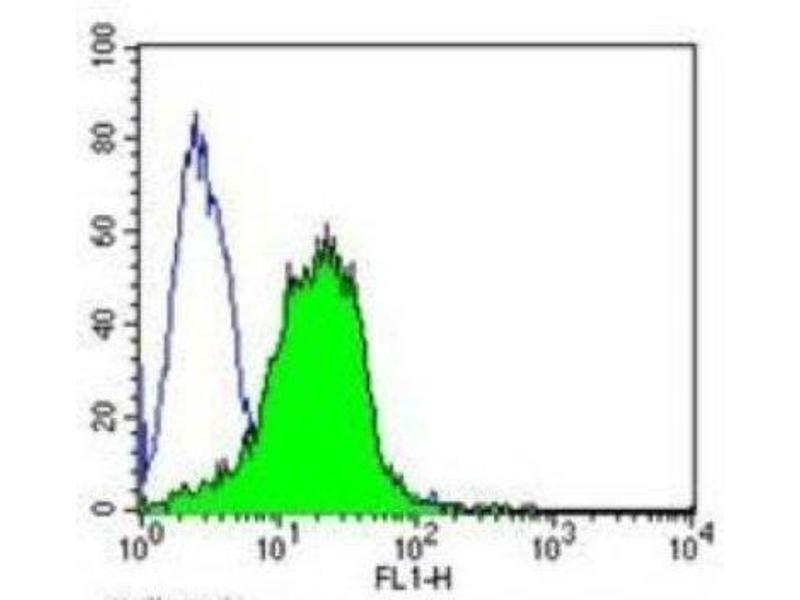 Flow Cytometry: AHR Antibody (RPT9) [ABIN152674] - Analysis of Aryl Hydrocarbon Receptor in NIH/3T3 cells compared to an isotype control (blue). 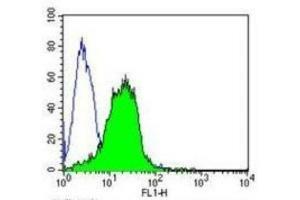 Flow Cytometry: AHR Antibody (RPT9) [ABIN152674] - Analysis of Aryl Hydrocarbon Receptor in PC-3 cells compared to an isotype control (blue). 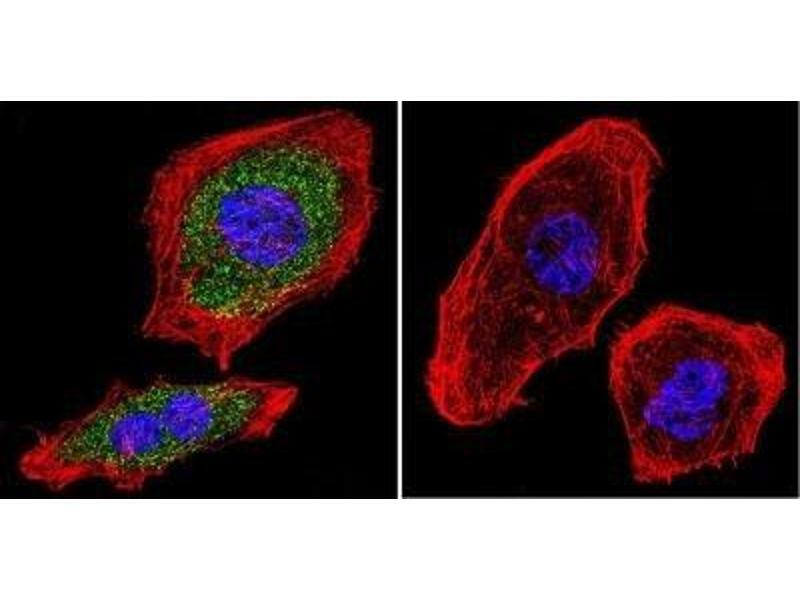 Immunocytochemistry: AHR Antibody (RPT9) [ABIN152674] - Analysis of Aryl Hydrocarbon Receptor using Aryl Hydrocarbon Receptor Monoclonal Antibody (RPT9) shows staining in A2058 Cells. 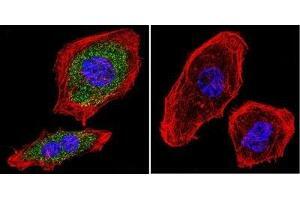 Aryl Hydrocarbon Receptor (green), F-Actin staining with Phalloidin (red) and nuclei with DAPI (blue) is shown. Cells were grown on chamber slides and fixed with formaldehyde prior to staining. 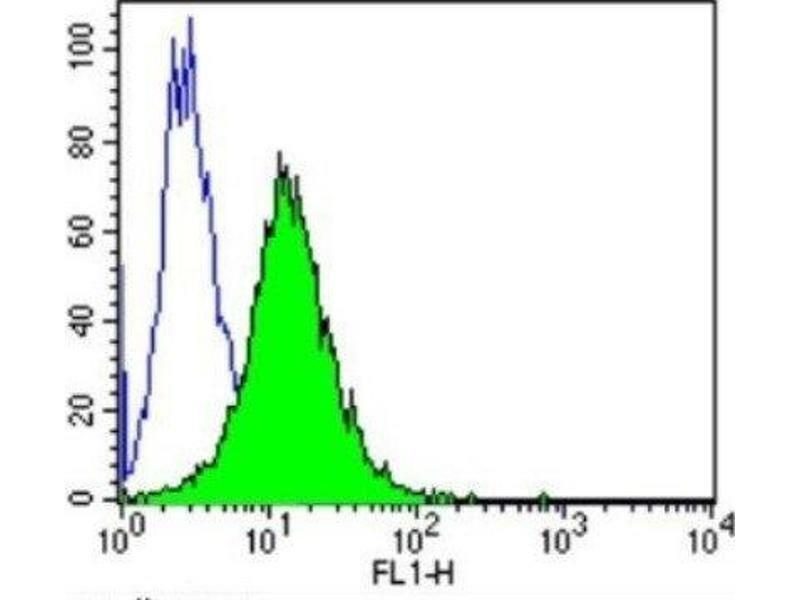 Cells were probed without (control) or with an antibody recognizing Aryl Hydrocarbon Receptor at a dilution of 1:20 over night at 4C, washed with PBS and incubated with a DyLight-488 conjugated. 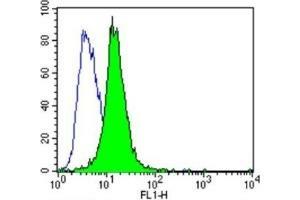 Flow Cytometry: AHR Antibody (RPT9) [ABIN152674] - Analysis of Aryl Hydrocarbon Receptor in Hela cells compared to an isotype control (blue). 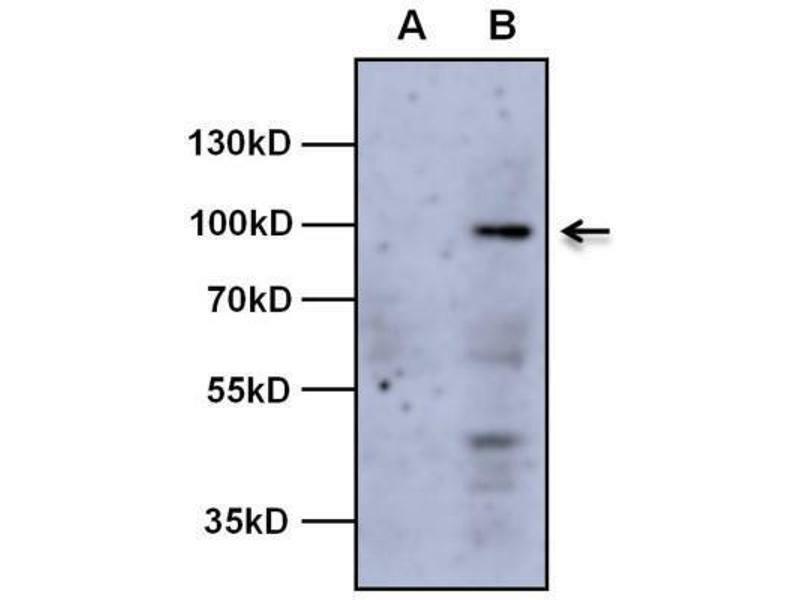 Western Blot: AHR Antibody (RPT9) [ABIN152674] - Analysis of 40 ug of HEK293 lysate overexpressing Aryl Hydrocarbon Receptor (right lane) or empty vector control (left lane) and 10ul of PageRuler Prestained Protein Ladder. 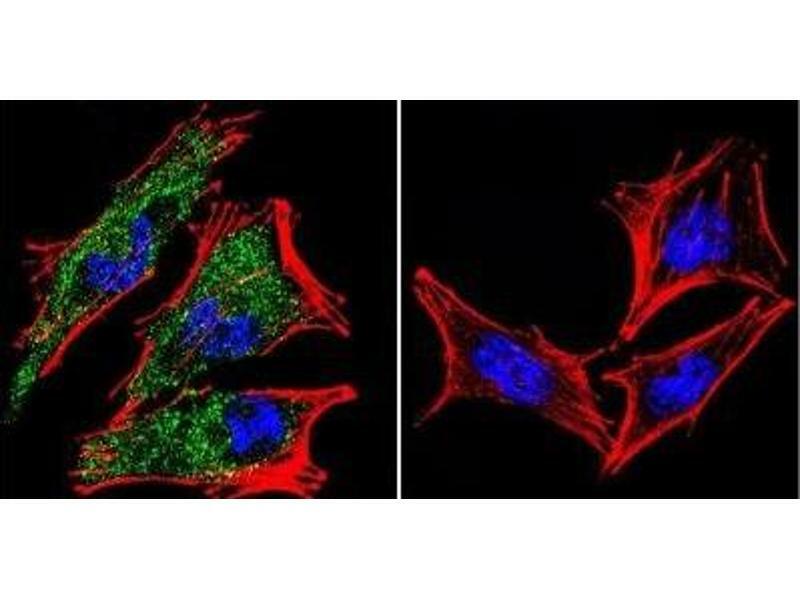 Immunocytochemistry: AHR Antibody (RPT9) [ABIN152674] - Analysis of Aryl Hydrocarbon Receptor using Aryl Hydrocarbon Receptor Monoclonal Antibody (RPT9) shows staining in Hela Cells. Aryl Hydrocarbon Receptor (green), F-Actin staining with Phalloidin (red) and nuclei with DAPI (blue) is shown. Cells were grown on chamber slides and fixed with formaldehyde prior to staining. 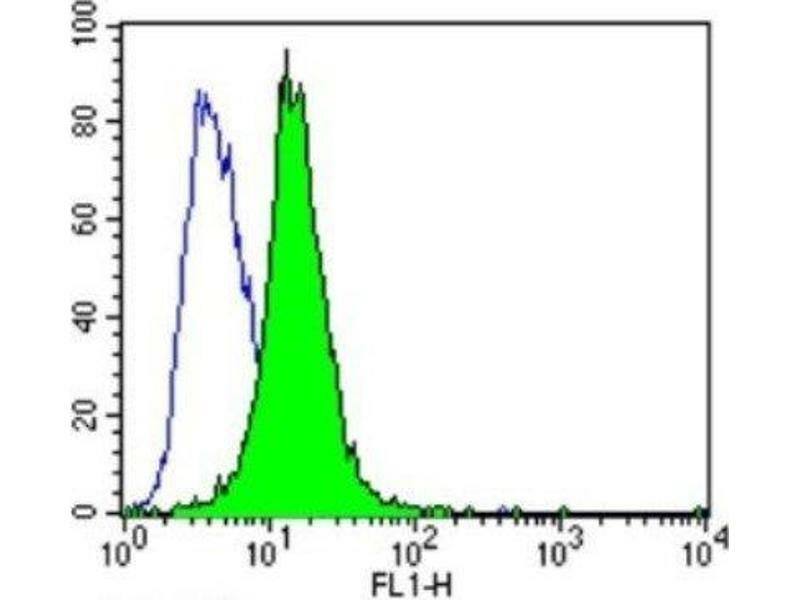 Cells were probed without (control) or with an antibody recognizing Aryl Hydrocarbon Receptor at a dilution of 1:20 over night at 4C, washed with PBS and incubated with a DyLight-488 conjugated. 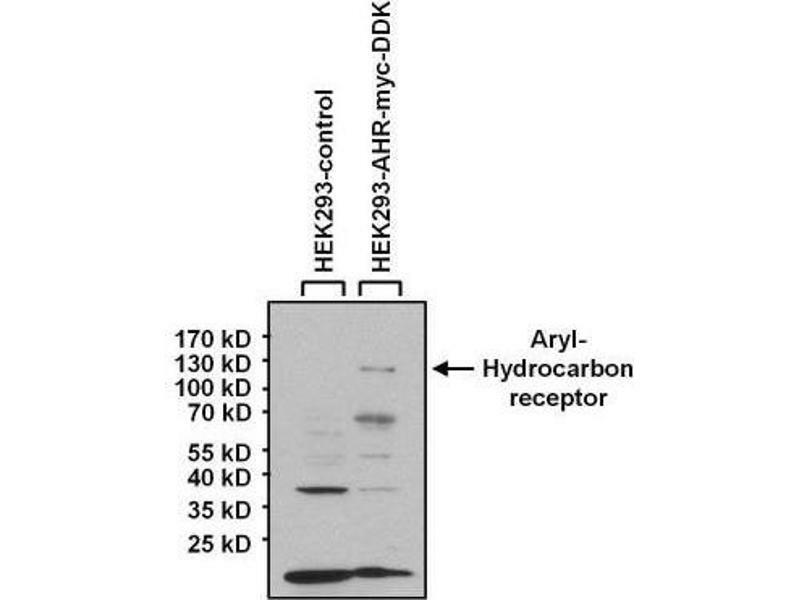 Specificity Detects the Aryl Hydrocarbon Receptor (AHR). 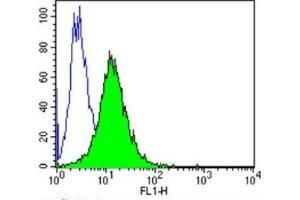 Immunogen Synthetic peptide corresponding to residues R(12) K R R K P(17) V(22) K P I P A E G I K(31) of mouse AhR. Application Notes Western Blot 1:500 - 1:2000, Chromatin Immunoprecipitation 1:100, Flow Cytometry 1:50, ELISA 1:100 - 1:2000, Immunocytochemistry/Immunofluorescence 1:10 - 1:100, Immunoprecipitation 1:10 - 1:500, Immunohistochemistry-Frozen 1:10 - 1:500, Gel Super Shift Assays 1:1 - 1:100ELISA use reported in the literature (PMID: 10413464). May be useful in IHC, IP, and WB. 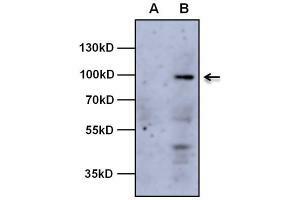 IP: A single ~95 kDa protein representing AHR from Hepa 1 cytosol. IHC: Staining of AHR in rat liver results in strong cytoplasmic and some nuclear staining. 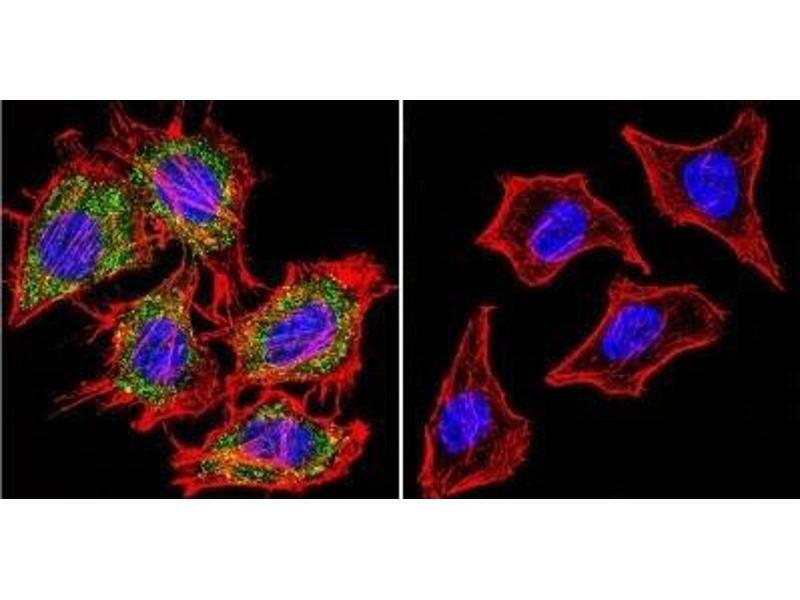 Immunocytochemistry: AHR Antibody (RPT9) [ABIN152674] - Analysis of Aryl Hydrocarbon Receptor using Aryl Hydrocarbon Receptor Monoclonal Antibody (RPT9) shows staining in U251 Cells. 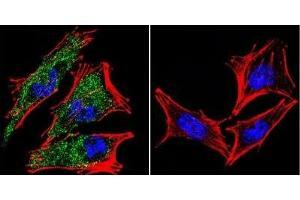 Aryl Hydrocarbon Receptor (green), F-Actin staining with Phalloidin (red) and nuclei with DAPI (blue) is shown. Cells were grown on chamber slides and fixed with formaldehyde prior to staining. 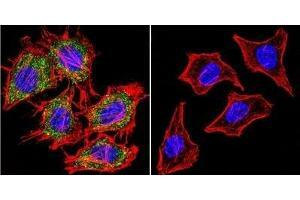 Cells were probed without (control) or with an antibody recognizing Aryl Hydrocarbon Receptor at a dilution of 1:20 over night at 4C, washed with PBS and incubated with a DyLight-488 conjugated. 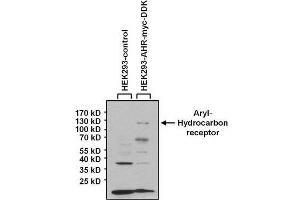 Western Blot: AHR Antibody (RPT9) - Analysis of Aryl Hydrocarbon Receptor was performed by loading 20 ug of HEK293 lysate overexpressing Aryl Hydrocarbon Receptor (right lane B) or empty vector control (left lane A) and 10ul of PageRuler Plus Prestained Protein Ladder onto a 4-20% Tris-Glycine polyacrylamide gel.